DID ORSON WELLES REALLY CAUSE A NATIONWIDE PANIC? It wasn’t sponsored. It wasn’t rated. And it was broadcast opposite Network Radio’s most popular program, Sunday night's Chase & Sanborn Hour with Edgar Bergen & Charlie McCarthy and ratings in the 30's on NBC. Subsequent investigations into the "panic" have found it to be based in isolated and unsubstantiated events multiplied many times over by a press eager to discredit radio as a news source. There was no running into the streets by fearful listeners, no epidemic of heart attacks and no suicides to escape a fate worse than death. My comments about the broadcast and its aftermath, abridged from the 1938-39 chapter of Network Radio Ratings, 1932-1953, are also posted. And here are several pertinent timing facts about the broadcast that reportedly “panicked millions” of listeners. 00:00 Program theme and announcer introduction. 00:37 Orson Welles’ prologue and disclaimer. 02:20 Mock weather forecast and introduction of dance band remote. 03:38 Bulletin of gas explosions, (later presumed to be rocket launchings), on Mars. 05:12 Announcement of coming interview with a Princeton astronomer about Mars. 05:44 Dance band music continues. 06:05 Newsman “Carl Phillips” interviews Princeton's "Professor Pearson," (Welles). 11:04 The "Martian invasion" described by Mercury Theater actors portraying reporters, government officials and armed forces personnel. 58:35 Program theme and announcer closing. Could only 29 minutes of radio drama - plus the seven minutes leading up to it - create such a mass panic in so short a time? Or was that reaction grossly over-blown? And was something else behind the press-led public outrage? Listen to the audio posts below and see what you think. It's only natural if you notice some similarity in the voices because Kenny Delmar played four different roles in the drama, Ray Collins and Richard Wilson played three roles and Paul Stewart, Bill Herz, Carl Frank and Welles each played two. Starting now we couldn’t soap all your windows and steal all your garden gates by tomorrow night so we did the next best thing - we annihilated the world before your very ears and utterly destroyed CBS. You will be, I hope, relieved to learn that we didn’t mean it and both institutions are still open for business. So goodbye, everybody, and remember the terrible lesson that you learned tonight - the grinning, glowing, globular invader of your living room is an inhabitant of the pumpkin patch and if your doorbell rings and nobody’s there, that was no Martian, it’s Halloween. 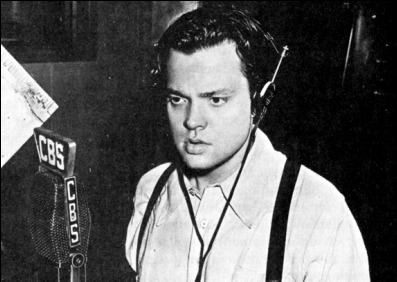 The War of The Worlds was excellent radio drama based in classic fiction. Its aftermath was sensationalized journalism based in ulterior motives that backfired when the notoriety landed a sponsor for Orson Welles' Mercury Theater. (1) Both The Chase & Sanborn Hour and Mercury Theater of The Air were aired once at 8:00 p.m. Eastern Time, 7:00 p.m. Central, 6:00 p.m. Mountain and 5:00 p.m. Pacific Time, with no repeat broadcasts.